The Spanish national newspaper ABC ran the following interview last week (with photos by Nicolás Haro). 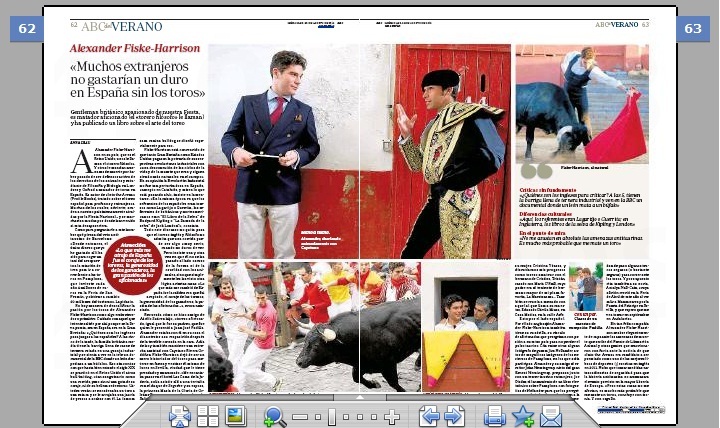 How to ask this man what he thinks of bullfighting ban in Barcelona? “Since then, the only money I’ve spent there has been to take a taxi from the airport to the train station to go to run with the bulls in Pamplona, a city that invests 4 million Euros each year in the Feria de San Fermín, and gets in return 60 million Euros from tourism.” Clear cut. I enclose my transcript of the original interview in English below. Now, I must leave my favourite city in Spain, Seville, and head north to run the bulls in Cuéllar with my great friend and fellow bull-runner ‘Buffalo’ Bill Hillman from Chicago. Bill is also the founder of the Windy City Story Slam, and you can read about their barnstorming performace including John Hemingway – grandson of Ernest – and Irvine Welsh of Trainspotting fame at the Edinburgh Fringe Festival in my article in this week’s The Spectator here. 1. As you probably know, some Spaniards think that the fiesta brava ( Bullfighting and the surrounding culture – AFH) projects a poor image of the country abroad, while many foreigners feel attracted precisely by these things. How do you explain that? Bull-baiting with dogs was legal in Britain until 1835 and we had a “bull-run” in Stamford in Lincolnshire until 1839. However, times change and both the UK and US had powerful industrial revolutions which took people away from the countryside and the natural cycles of life and death. So, today, some people are horrified when they even think of death, let alone when they see it. 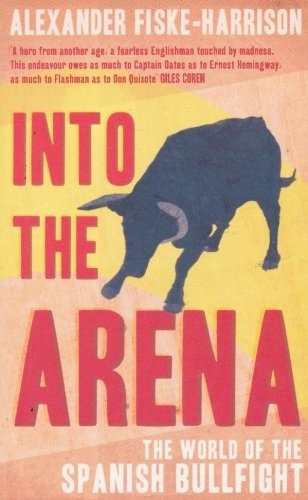 Bull-baiting was brutal anyway, and had no redeeming features, which in the corrida is the beauty of the spectacle. The aesthetics of elegance and courage weigh against the ethics of injury and death in the plaza, just as the aesthetics of leather weigh against the merciless machines of the slaughterhouse. Of course, this is not to say that Los Toros are not “strong drink” as we say in England. I mean, they are not easy to watch, this is “serious” as Federico García Lorca said, but then, nothing that is important is not difficult. 2. Tell me some Spanish spots that you really enjoy and recommend: such as restaurants, bars, hotels or plazas de toros. Also, you mentioned good friends in Spain, can you expand on this? Sevilla is where my aficion was born, and, after that, my toreo. There, in 2009, my friend Adolfo Suárez Illana first introduced me to his brother-in-arms, the matador de toros Juan José Padilla. That night they also introduced me to the Maestro Eduardo Dávila Miura. I went on to fight in tientas with all three of them, to be with Adolfo in his cuadrilla the last time he fought at a festival as an aficionado practicó – (as his father your Prime Minister had also done). I was with Padilla at his house before his reappearance corrida in the plaza de toros of Olivenza after his terrible cornada. And I worked with Eduardo for a year and he was there in the plaza when I had my own little “alternativa inglés”. These are three of the most emotional moments of my life and all are children of Seville. I used to love staying at the Hotel Las Casas de la Judería, although that was when the Duke of Segorbe owned it, and I used to attend a tertulia to talk with he and his wife – the King’s cousin Princess María de Gloria de Orleáns y Braganza – along with the ganadero of Saltillo Enrique Moreno de la Cova and his wife Cristina Ybarra and we would discuss my progress as an amateur torero. Oh, and also there were Cristina’s brother Tristan and his wife Maria O’Neill whose father was the teniente de hermano mayor of my favourite plaza, La Real Maestranza de Sevilla, in whose library of tauromaquia my book has its place. I wonder if there are any others there in English? I wanted to send a Spanish copy, but the publishers worried that it was too introductory. In fact, I should like to rewrite it for Spain, cutting the introductory parts, and putting instead more about my English perspective on this strange world. Of course, I would keep all the stories of the people in the mundo taurino I became close to. And also my passages of debate and argument, growing as they do from my background –an animal-loving Englishman, who studied as an undergraduate and postgraduate in philosophy and biology at the universities of London and Oxford. Near the plaza de toros, on calle Arfe, is Casa Matías. I have known Matías for years and return to this small dark space to hear his voice when he sings sevillanas or cante jondo, laugh with Emilio behind the bar, and sit under the head of the Astolfi toro Rafa Chica. I used to meet my Maestro, Eduardo Dávila Miura, here sometimes and we would drive off into the campo – often to face the high-horned animals of his uncles, Antonio and Eduardo Miura. Most recently, for the toritos of Astolfi. I often met novilleros in Matias and other characters you will not find in Las Casas de la Judería. 3. Do you think a ban against bullfighting, like in Barcelona, can damage tourism? I think that Barcelona is well-suited for the small number of people outside the Latin world who are so deeply against bullfighting they won’t go to Seville or Madrid. I was told the other day that Pamplona’s city council, which is a city whose small size conceals its giant heart, spends 4 million Euros on the Feria de San Fermin, and receives 60 million back from tourists. I know that the only money I have spent in Barcelona since the ban is on a taxi from the airport to the train station so I can go on to run the bulls. 4. As far as I know, you have suffered even death threats because of your dedication to bullfighting. Can you expand on that for me? Many people used to contact me via my blog, The Last Arena, to write threats. “I have hired American mercenaries to come to Spain to kill you,” “The Animal Liberation Front wants you. You will burn, burn, burn!” When my book was shortlisted for one of the largest literary prizes in Britain – the William Hill Sports Book of the Year 2011 – they had to have security at the prize-giving at the largest bookshop in Europe. There were other incidents, but I do not let them affect me. I am much more likely to be killed by a bull. 5. What possessed you to write your book? Did this book change your life or the life of others? 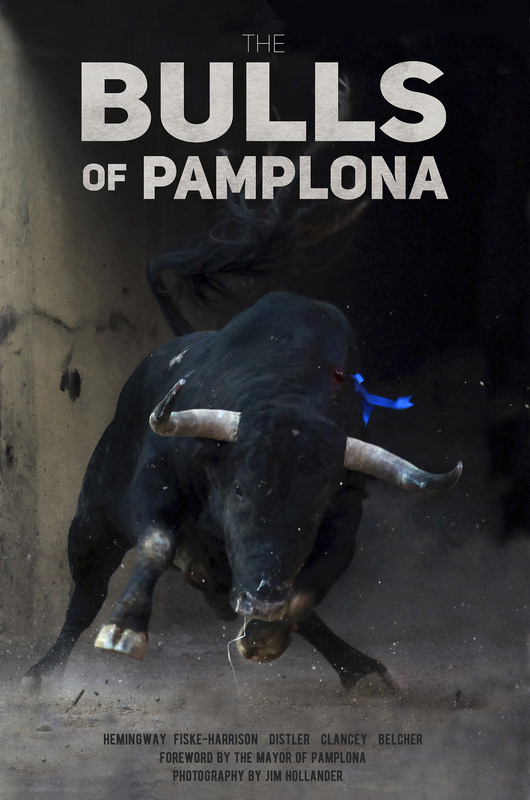 I wrote the book because after being taken to a few bullfights by my parents, and reading Ernest Hemingway, I started to think the loud pro-animal voices – which are all you can hear in the UK, but not all the voices that exist – might not be right about this. “A las cinco de la tarde“, as García Lorca says, the average British family sits down, with their stomachs full of factory-farmed roast calf, to watch a nature documentary on the BBC where a lion tears apart a buffalo. Who are the British to judge Spain? When I arrived in Spain, it was the warmth with which I was accepted which changed me, that and the courage of the toreros, the generosity of the ganaderos and the passion of the aficionados. Most of all, though, were the moments of art: Morante’s capote in Seville with the Victorinos in ’09, Tomas’s muleta in Jerez the same year. 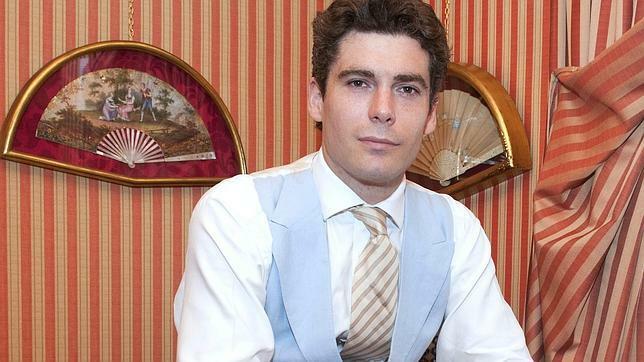 In 2011 I watched Cayetano Rivera Ordóñez from the callejón in Ronda, creating a faena in which he surpassed himself as a torero while standing over the ashes of his grandfather, Antonio Ordóñez, in that ancient plaza. Cayetano became a friend during the chapter on him in the book, and by 2011 we were working together on a cinema documentary for an Oscar-winning producer, but I am sworn to secrecy about that. And, of course, Padilla, who forms several chapters of my book, and whose courage is itself art. My life is indeed changed. 6. Before I asked you about your Spanish friends, I will finish by asking you about the British, Americans, etc, who you know love the deep Spanish traditions, el toro y la fiesta. Can you give me names? The most senior ambassador is Noel Chandler, who lives in Madrid and Pamplona when he is not following the bulls around Spain. He especially follows Cayetano’s brother Fran Rivera, whom he’s known since before his alternativa, and his grandfather Antonio before that. Similarly, there is Joe Distler, whom I mention in the chapter on Pamplona, but like Noel has since become a much dearer friend. He has not missed an encierro in Pamplona since 1967, and knows the Spanish and Basque runners as well. It was he who introduced me to two of the greatest, Julen Madina and Miguel Angel Eguiluz, with whom we had breakfast after a bull ran me over on calle Estefeta on Saturday. Joe, who was taught to run by Matt Carney, is usually found with the former rodeo rider turned mozo Larry Belcher and his Spanish wife Anna and the soulful enigma Bomber who runs the bulls in sunglasses and always has, even in the black and white photos. Of course, all the best photos are taken by the great warzone photographer Jim Hollander, who used to run as well. And there is the author of the best book in English of Pamplona, Ray Mouton, who now lives in France, and our mutual friend, who stands with me when I run la curva, Tom Turley, along with our friend John Hemingway, the grandson of the great Ernest. In fact, John Hemingway, Joe Distler and I are currently trying to put together a electronic book on Pamplona, with photos by Jim Hollander, so people who turn up in the town can learn a little of the history, the people and the culture of the Fiesta, and also how to run as safely as is possible. I could go on and on – let me not forget David Penton, secretary of the Club Taurino of London and Lore Monnig, President of the sister peña taurina in New York – but I will end instead with my girlfriend, Antalya Nall-Cain, whose aficion grew from seeing Manzanares leave by the Gate of the Prince in Seville in the Feria de Abril this year and watching me run in July. Perhaps she will get to see me torear this September in Andalusia, hopefully with something easier than Miura or Saltillo!